Successfully piloted in Summer 2017, the tool to submit midterm or final grades from Blackboard to INFOnline is available in your fall courses. All faculty are invited to use this tool for the following reasons. Reason 1 – You asked for it, and we listened. This feature has been long requested by faculty and it is finally here. College leadership is excited to provide you with additional tools to support your successful completion of the final grade submission process. Reason 2 – Even if you don’t use Blackboard, you can use this tool. Every course taught at MATC has a course shell in Blackboard that contains a final grade tool called ILP Integration. 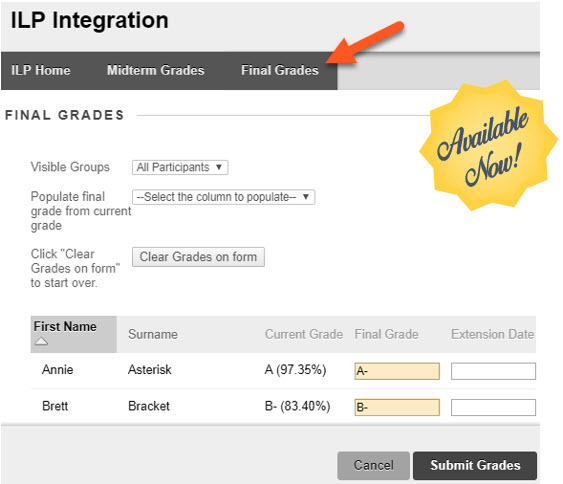 If you do not use Blackboard to provide continuous grade feedback to students, you can still use this tool to submit final grades to INFOnline through the tool’s simple form. If you already use Blackboard’s Grade Center throughout the semester, you can configure a Total or Weighted Total column to calculate a final letter grade to use as a reference when submitting final grades through Blackboard. You will confirm and send these grades to INFOnline through completing the tool’s simple form. With such ready access to a final grade submission tool in Blackboard in addition to INFOnline, there are few reasons to miss the December 29th deadline for final grades. Reason 5 – Support resources are available. We have a variety of resources available to help you learn how to use this simple and efficient tool. Review our tutorial, FAQ, and training videos. Contact the TLT Department if you have questions. This entry was posted in News and tagged blackboard, Final Grades, ILp by Megan Hamilton. Bookmark the permalink.